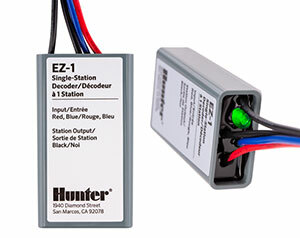 Hunter Industries released its EZ Decoder System (EZDS), which allows for two-wire installations. EZDS is compatible with all the features of Hunter’s HCC and ICC2 controllers, along with their respective Hydrawise and Centralus central control platforms. Contractors can plug in the EZDM two-wire output module to enable up to 54 stations of irrigation, plus a master valve, on a single pair of wires and then place EZ Decoders at each valve. EZ Decoders are small, waterproof and come with color-coded wiring and an LED status light. They do not require special wire or connectors to function. The system can coexist with conventional output modules, allowing hybrid functionality of both direct-wired valves and decoder operations in the same controller. This technology also permits easy conversion of a conventionally wired system to two-wire using the existing wiring bundle, according to the company.